The Animal Crossing Direct has taken place, and revealed a surprisingly extensive update for Animal Crossing: New Leaf. We knew that the 'Welcome amiibo' update and new edition would introduce the figures and cards into the much-loved 3DS game, but Nintendo went further with new minigames and additional features to jump into. First of all, the update is available right now, so it's worth getting that downloaded right away. Below, also, are the Direct broadcasts and some extra trailers. So, what are these new features? Taking the lead from Nintendo's press releases and websites, let's split things up into amiibo and non-amiibo additions. For starters, as you'd expect the game will support all existing Animal Crossing amiibo, including the figures that rolled out with Animal Crossing: amiibo Festival and the cards of Animal Crossing: Happy Home Designer. The figures, though, have one extra feature over the cards, which we'll get to below. The first thing to do is to find a magic lamp; this will unlock Wisp and, with it, the ability to scan amiibo. You can scan once a day to invite a character to live in your town, or they can just visit and leave you a gift. Once you've accessed Wisp a new area in the town truly comes into play. The RV Campground will appear in your game with the update (and you don't strictly need amiibo for this area to appear); it's run by the hippy Harvey. You can have interactions with new characters here, and amiibo that are scanned visit in rather snazzy RVs. A nice touch is that amiibo from a couple of other IPs bring unique visitors - so far this includes Splatoon and The Legend of Zelda figures, which bring special RVs and some particularly neat outfits and characters. Scanning an Animal Crossing figure (not a card) also gives you great odds of receiving special Wii U and New 3DS in-game items; these can also be bought with fortune cookies at the Nooklings' shop, but that'll naturally take more effort. The new games are 'Desert Island Escape', unlocked with the Wii U item and a fun spin on an amiibo Festival-style game. The New 3DS item unlocks the Animal Crossing Puzzle League, which at its core appears to be a match-3 game. In both cases scanning amiibo (cards and figures) adds participants and/or bonus abilities into the game. MEOW (Mutual Exchange of Wealth) coupons can be earned from Harvey in the RV Campground by completing tasks (such as gathering items, weeding and so on), and can be redeemed on special items at the campground or from visitors. The amiibo Camera mode may mention the NFC range, but can also be used without scanning in extra characters. This is a simple camera app where you can have game characters appearing in real-world photos, an idea Nintendo's used a few times on 3DS. Photos can be shared to social media using the Image Share tool, as well. Some extra features are there to simply make life easier, too. You now have a 'storeroom' where you can hoard more items. Decorating your home is easier too with increased customisation, a feature lifted from Happy Home Designer. Linking Happy Home Designer save data also unlocks 20 'giant furniture' pieces to buy, too. Those are the key features in the new, and free, update to New Leaf. Let us know what you think in the comments. This was a delightfully weird and quirky direct like the ones we got when Satoru Iwata was still alive. I'm playing around with the update now and so far so good. Looks like I need to get an amiibo scanner for my 3DS. Wow, 1 amiibo scan for 1 day ? We still can use time travel to change the date and scan again. But be careful about Villager Loss. I knew there was a reason I've been aggressively collecting these AC amiibos! Really though, this looks like a lot of fun! And is truly an example of the Nintendo Difference™. Any other company would've charged $19.99 for this content... if they would've done it at all, since adding new content to a game over a year old is virtually unheard of in the "Triple A" arena. Cool update, but definitely not enough to get me to come back to this game. I guess I'm just not a big fan of games like this. 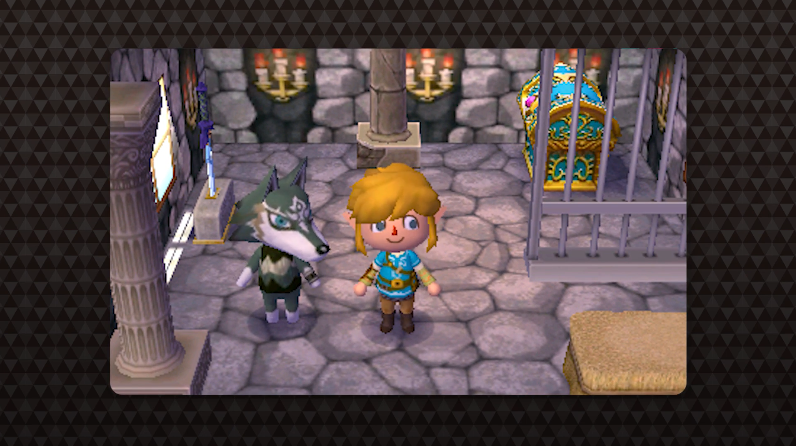 Can we try to invite wolf link to our town or do the IP characters never leave their RV? If the meow coupons need the campground, and the campground requires amiibo then don't the coupons require amiibo? @SmaMan Considering the price of amiibo they really charged more than $19.99 for this content. This is really nice of Nintendo; I've not heard of games ever getting another 25% content as a FREE update, especially three years after launch! This might just rope me back into New Leaf. @Yorumi I believe the campground is built when you update; I'm downloading it now, though (my broadband is slow at the moment), so am not quite sure yet. @Yorumi The campground will be there without amiibo. I think you need to find Wisp to have the ability to scan amiibo though. The storeroom feature is a very welcome addition, as that was one of my few, if not my only complaint about the game. These new features are really cool, I'm glad to see some new stuff for Animal Crossing: New Leaf since it looks like its developers are busy with Splatoon and we won't be getting a new game for a while. @jsa @ThomasBW84 hopefully that's true, it could be nice having some tasks to complete to give something to do. Biggest problem I have with animal crossing is it too quickly becomes routine. I dumped hours into this game. I can't see myself getting back into it with this update unfortunately. Would be nice if they made a mobile version of the game though. Well, I guess the biggest question is, what's the easiest way to find that magic lamp? Seems like nothing from this update actually happens without it. Man am I going to get an earful from Isabel when I return there after installing this, and one more snide comment from my residents about the long absence and I'm sending out eviction notices. I enjoyed the Direct. The presentation was very... Japanese... and I'm into their weirdness, but the content of the Direct itself was really unappealing. I'm not really going to play New Leaf again just because of this update 4 years later. So I just jumped in and the campground is there, no amiibo necessary, and I was able to visit with Pave and buy a few exclusive items using the new coupons (FYI: These items to appear in the Catalog, but can not be re-ordered). The campground entrance itself appears in the mountain wall, where ever that may be in your town. Unfortunately it wasn't a great place, I'm going to have to demolish a wind turnbine and redecorate a bit. I ordered the new secret store room from Tom Nook (more loans, yay), and well that is all I have found so far. Awesome update and a reason to finally use my Animal Crossing amiibo. New Leaf is such an amazing relaxing title. Too bad the Puzzle League isn't multiplayer. If they had that and 3D puzzles like Pokemon Puzzle League then I would jump right back in. @Yorumi does that mean you can divide the cost of an amiibo down based on how many titles you own that it works with? You would have to if applying your logic. so how do you get the lamp and the nintendo items? I would assume you get the latter with fortune cookies?! I bought amiibo figures and cards for HHD (which I love) and for Amiibo Festival (which I love less but still play to chill) plus I have Zelda line amiibo from smash and splatoon amiivo so this really is a free update to me and the only cost will probably be for a couple of the new campsite series and the sanrio ones so I'm satisfied. I'm actually impressed with how many games my amiibo collection work with so I don't feel I've wasted any money. Have Robin's outfit to wear and Lucina's sword would be awesome in my opinion. Does anyone want to help me restart my town, help me save some items and what not? @Yorumi: I look at it this way. You're paying $5 - $13 for a figure/collectible/toy and the software is extra. @faint A lot of amiibo are pretty specific to a title. When it comes to overall cost of things, nintendo is generally more expensive than anyone else. They don't do sales, the wiiU is basically expensive drm if you amortize that over the number of games people got etc. I'm not trying to completely tear down nintendo here but when you look at what they give you compared to the cost, they tend to be placed among some of the more exploitative devs. It's not that everything is bad, but taken as a whole nintendo really doesn't offer their customers a whole lot of value. Aside from all that acting like this is some great deal when they are expecting you to buy at least one, but really multiple $15 figures to make use of the content doesn't favor nintendo all that well. @TheLZdragon yeah that's fine, I'm mostly just pointing out how this isn't some amazing deal or anything. Amiibo overall is a difficult thing cause some value the figure more than anything, others don't care as much and it then amounts to little more than extremely expensive dlc. Doesn't Wisp only show up at nite? I really like those two mini games! actually its over three years old. I found the lamp Wisp is in by just wandering about the town. I restarted the game a couple of times to let the content update - HHD isn't integrated on the first update. The lamp tells you it needs to be inside and to take it to your house. You can then interact to get Wisp once a day. Mmmmh... I think you're seeing this in a very wrong way. Amiibos are like a season pass for several Nintendo games, and they give you a piece of plastic (the amiibo itself) too! That for me, is a great deal. Most DLCs or Season Pass from other games are at the same price as an Amiibo figurine and give the same content or even worse, content that works with only 1 game btw. Amiibos have something that no other DLC or extra content for any other game has, you can use it in different devices with different accounts, meaning you don't need to own all of them if you have friends with different amiibos, and what's even better, you can sell them. Hah, they took the best part of Amiibo Festival and added it to the main game. Is it a rescue of a good feature, or stealing a game of its only redeeming quality? yesterday i was a little annoyed about the poor state of my nintendo and the poor 'rewards' on offer. then today animal crossing fans get an upgrade to new leaf and its not rubbish. so thank you nintendo. i guess this is away of getting more people to buy the amiibo and the cards. i have never been interested in buying amiibo or the cards and the happy home designer game never interested me. but now i might buy some cards and related amiibo. so weldone nintendo. maybe nintendo will do similar upgrades for amiibo in other games. mario kart 7 would be a good start. each amiibo figure could be raceable witb thier own car? I'm really tempted to buy some amiibo cards, the only thing holding me back is the price of the NFC adapter (£18 for an NFC chip and an IR scanner!). Another thing, how do you unlock the new furniture storage thing? I have the update but I don't have the feature it seems. This isn't a bad thing... it's not a good one either. Eh. Does anyone know if amiibo from IPs other than AC, Splatoon, and Zelda give you cool gear? @seb5049 it's a home expansion from Tom Nook. Fun. It'll be interesting to see if Ganondorf wants to come for a visit! This update sounds sweet! I'm hoping for a sequel is coming soon, but I'll take a free update that doesn't require Amiibo. Good gawd some of you are a tough crowd. My wife (1,000+ hours in) was puzzled when I said I wanted this game, because she never thought it'd be my type of game, as it has a lack of exploding helicopters. But I love it (600+ hours), it's a perfect little chill game. I always thought it'd be perfect for some DLC - extra islands, an expanded town or even an extra town. While we don't have that, we have a shed load of extra content, for free. We have amibo cards and figures, but we bought the figures just because, and selling the duplicate cards at CEX means they almost paid for themselves. You don't have to use amibo, it just adds another element. I'm really impressed Nintendo has done this, and for free. Top fan service. Even if there still aren't any exploding helicopters. @Mii_duck Exploding Helicopters will be added in the next update. They will use the guardian amiibo from BotW. Eh, I like the fact that they are still supporting this game but none of these new features interest me even the slightest. Hopefully this update doesn't take away from development of Animal Crossing Switch. Not sure it will drag me back - put in 400+ hours initially. Will download the update and see I guess. I actually hoped for Boris when I heard they were adding another 50 villagers but never thought they'd actually bring him back. I wonder if the cards are expensive....I might boot up New Leaf again....didn't they say that the update clears the weeds from your town? I think I'll need it. Also it's cool they brought Sprocket back too. I always thought he was a strange exclusion since he's so unique. Gah!!! i should've been updating it while i was watching >n< now i gotta wait..
Wow. This is super generous, especially for a three year old game. They're really breathing new life into New Leaf, I'm gonna have to fire it up tonight. I have just had my town valued up by Tom Nook just to see how much it is actually worth. Tom Nook just appraised London as worth 368,018,066 Bells. ...The look on his face was absolutely priceless when he added it up to nearly 400,000,000 Bells. Hehe. Normally, I'd be hyped for this update but...how am I supposed to get excited for this when there might be a new Animal Crossing might be coming out in March? I wish I just knew if it was going to be coming out or not but their lack of Switch news leaves me wondering "should I go back to New Leaf? Or should I wait until the next game?" Where's my damn magic lamp? Scanned tom nook and got both consoles in one visit. Even with all of these features I am not sure I want to dive back into this game considering the hundreds of hours I have already put into it. The fact that you can now restart your town without erasing your character is awesome and hopefully they carry that into future titles because that really should have been in there from the beginning. @rjejr Yes, that was something. lol. @DBPirate I think this means a new one won't be coming out in march. :/ Unless you are talking mobile and that will be different anyway. Switch will get it, of course, but hopefully it has some feature overhauls. I think this will be the quintessential Animal Crossing of this type. But I don't follow it closely. I got the lamp yesterday. I found it at the beach. Before that, you will suddenly encountered by ??? that suddenly asking you to find it out when you near of the beach area. I found it at the beach area. You will encounter with ??? that suddenly talking to you. I got it at the beach area. Go near of the beach and you will encounter with ??? that talking to you. Sigh, I had no one asking to get Animal Crossing, already started again. Well its good to see people excited and the content looks pretty good but I'll likely not bother with the series still. I'm trying to start a new town and I can't for the life of me get one with a good layout. There's too many rocks, river is in a bad spot, too many ponds, clustered houses, buildings blocking areas. etc. I know nobody will believe me but... over the course of 3 months I've started the game up around 2000 times to start a new town that fits my requirements. I've cycled through 4 maps each time, typically choosing one that has a decent layout only to find that in person it's features are greatly flawed. I seriously wish there was a way you could design the layout of your town instead of it being randomly generated. Omigosh! Now you can sit on rocks! Mind. Blown. It's so annoying wisp only appears from 12-4 am in the morning! Lots of players won't know Nintendo! they'll google it. Problem solved. Sit on the Rock ? Really ? @Anti-Matter Yup. You can sit on rocks now. @Yorumi .The update is Free. Costs Nothing. Nada. Zilch. The fortune you get to receive the WiiU console is so sassy : "Great artists are not appreciated in their time"
I've always dreamed of sitting on rocks. Btw, where's the new option to go home on the island?